Take a look at the domain name. Combine that with one of my personal mottos: “Work hard, play hard”. You now have a pretty good picture of my Thanksgiving! I’m not sure if this is a tradition in your parts but we keep it alive and well in the family. Things get even more interesting when family is involved in the actual game. We had just such a Turkey Bowl game this year: a perfect storm involving 3 brothers-in-law and a bunch of former high school team mates. I won’t give you a blow-by-blow but the highlights are necessary. 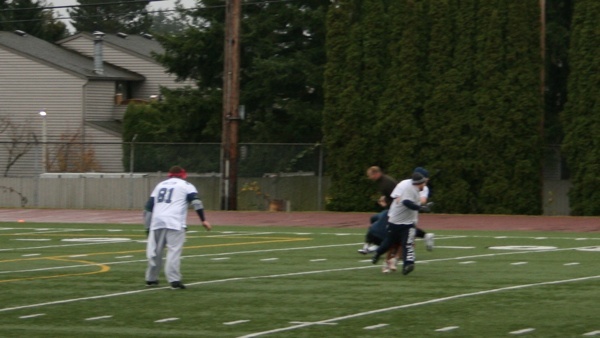 First, we were playing full-on tackle football. It’s like two-hand touch without holding back, somewhat akin to Rugby (in case you were wondering). 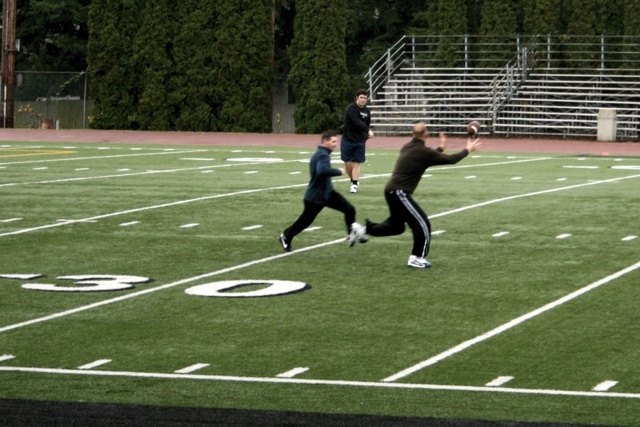 Alex (one of the brothers-in-law) setup a game at a local high school stadium, called a few former team mates from the football team, and we got cracking. It was a good set- solid quarterbacks, receivers, and even a couple of linemen. All-in-all, a good setup for a great game. A great game it was- I was on the team opposing both Jesse (brother-in-law) and Alex (the other brother-in-law). This was both fortunate and unfortunate: Jesse and I have an ongoing rivalry. I’ve challenged him to a wrestling match this year- one in which I intend to beat him soundly. He’s an excellent wrestler, outstanding athlete and all-around great guy. Still, he’s a superb target: 6’7″, 220 lbs., lean, extremely strong, and a highly skilled wrestler. You can’t make it any more of a stretch for a 170 lb., 6’1″ scrawny whelp like myself. If you can’t tell, the little person tangled up in Jesse’s legs is me. And yes, he’s about to go down – hard. In the end, Jesse, Alex, and Ben (all on the opposite team) won- by a single point. But, thanks largely to my efforts, they paid dearly for every point. 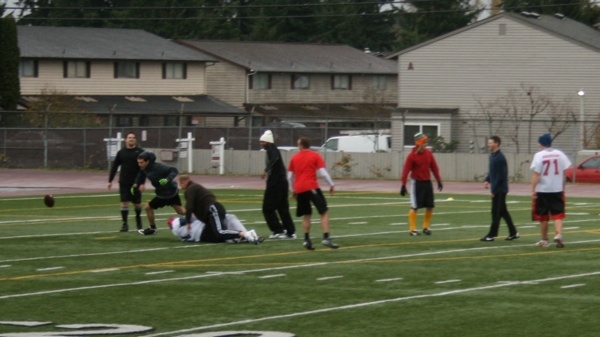 I made several tackles, scored one touch down, and kept Jesse from getting more than that. Unfortunately for me, I also paid for my heroic efforts. 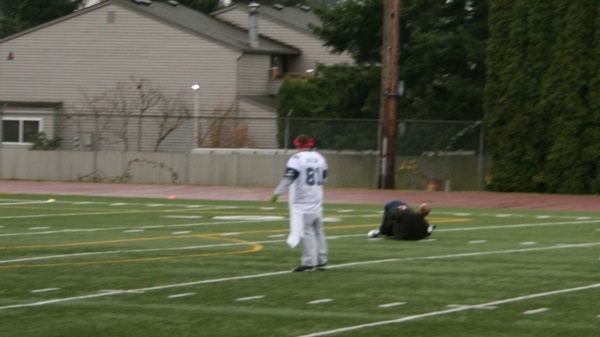 Toward the end of the game, I made a very poorly aimed tackle- throwing my arm in the path of the receiver’s legs. It’s not a strategy I would recommend and not one I would take, had I been in pads. To be honest, I wasn’t sure if I would be able to take him down. This indecisiveness and poor execution left my arm out of the socket and me writhing in pain on the ground. With cleat marks on my face, just to salt the wound. There wasn’t anything for it but to get back up and play out the game. Still, to this day, my right arm is only semi-functional. It is, after all, quite painful to dislocate a shoulder. I tried to take a large step up an unstable rock wall and slipped. That’s it. That’s all it was. That single step hyperextended my knee, pulled my leg almost clean out of the hip socket, and gave me a worrisome, swollen, disfiguring bruise just below the knee. To top it all off, that knee is still giving me trouble when standing and walking, let alone while running. It’s frustrating to realize the price of stupidity. Remember that. This blog is not for the faint of heart. There’s a mix of geekery, athletics, and, above all, living life to the fullest. The by-product of the latter is described in the domain: Accident Prone. For those who dabble in the sedentary lifestyle, I would tell you this: the scars are better than photographs for reminding you of the thrill of living. The pain fades with time and, with enough experience under your belt, pain itself can be little more than a distraction to the life you’re living. Get out there and give it a try.